We’ve all seen those Magic Bag commercials and eventually you will succumb to the marketing. 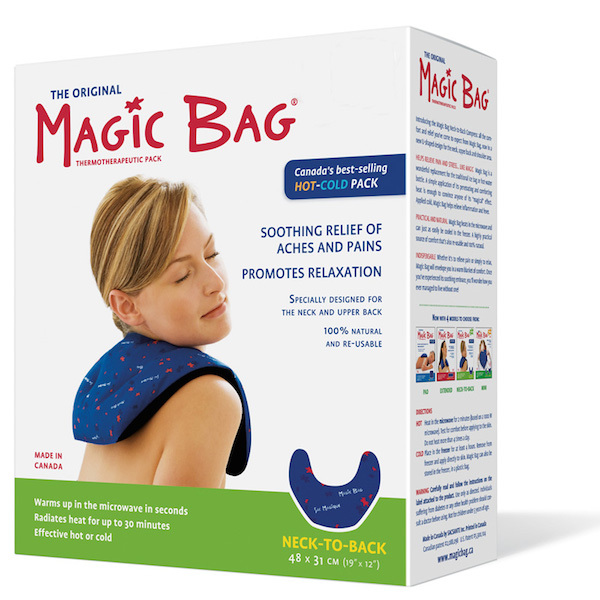 For stress, tension and pain relief, Magic Bags do work despite any doubts you may have due to their marketing efforts. For those that work in front of a computer, the Magic Back Neck to Back hot/cold pack can do wonders at the end of the day or during work. Since it is a bit longer in the rear to also hit your upper back area behind your neck, it can be a great combination especially when heated as it drapes over your shoulders nicely. To heat up the bag, all you have to do is pop it into the microwave for 1 minute intervals at a time according to the instructions. I found the bag to heat up quickly and the heat lasted about 15-20 minutes, despite being advertised for up to 30 minutes. Does the Magic Bag work? Yes. Is it the cheapest bag out there? It’s moderately priced for what it is and it does work. It’s made in Canada and made out of natural and reusable materials, so that’s a bonus. You can buy the Magic Bag Neck to Back here from Amazon.ca and Amazon.com.